When upgrading or personalizing the look of your home, there are many things that work together to create the style that you have in mind. While many things like new paint or carpet are obvious and not often overlooked, smaller items may be. These smaller details often have a huge influence on a home's style. Cabinets are used in a number of places in your home. They are used in the kitchen, in the bathroom, and sometimes in a laundry room or garage. These cabinets vary widely in style and construction depending on their purpose and the motif they are made to work with. 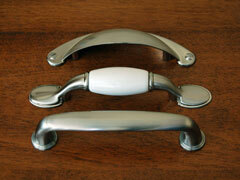 Cabinet hardware should be carefully considered when selecting cabinets or just upgrading a look. These hardware pieces consist of pulls and slides for cabinet drawers as well as handles, knobs, catches and hinges for cabinet doors. Some cabinet makers offer stock hardware that co-ordinates with their cabinets, but if their standard cabinet hardware doesn't appeal to you, you can find a more extensive selection of styles and finishes at a good hardware store or home center. Most cabinet hardware will work for both frameless or face-frame cabinets, but cabinet door hinges are often designed specifically for frameless or face-frame cabinet doors. Under mount drawer slides are usually designed for face-frame cabinet drawers only. New hardware is one of the easiest and most cost-effective ways to update the look of your kitchen cabinets. There are a variety of styles, finishes, and colors to choose from, whether you are looking for a sleek, modern, traditional, or country theme. Creative hardware and accessories will add new life to your kitchen cabinets and can make an amazing difference in the look and feel of your entire kitchen. Decorative cabinet hardware is usually made out of metal, wood, porcelain, or glass. Steel, brass, and stainless steel are commonly used for their strength and durability. Steel hardware is often plated to produce matte finishes like pewter, copper, brushed nickel, and antique brass or lustrous finishes like bright brass or polished chrome. In addition to the hardware's appearance, be sure that the cabinet door knobs and drawer pulls you select are comfortable to grip and easy to clean. If your hands or fingers tend to get stiff, consider C-shaped or U-shaped hardware rather than knobs. Ensure that the knobs and pulls have no recesses or crannies where dust and dirt could accumulate. Here at CabinetHardware.us, we offer convenient access to selected cabinet hardware manufacturers and dealers, as well as Service Magic, a service that can help you find local cabinet makers and installers. Popular cabinet hardware shop features decorative cabinet knobs, door handles, and drawer pulls. This one-stop source offers brand name cabinet hardware, lighting and accessories. New Jersey-based supplier of beautiful furniture and cabinet hardware in iron, brass, and wood. This well-known home decorating shop features cabinet knobs, drawer pulls, and decorative hardware. 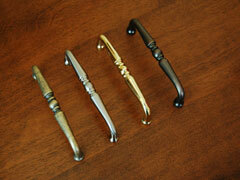 Defining cabinet hardware fashion in homes everywhere! Amerock offers an array of designs, colors and finishes that appeal to a variety of tastes. Leading manufacturer of decorative forged iron builders hardware. 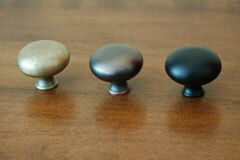 Acorn offers a variety of hardware styles and finishes. California-based manufacturer of distinctive door, cabinet, and bath hardware for fine homes. This Michigan firm features drawer slides, shelving units, and kitchen & bath storage systems. Their products are distributed through original equipment manufacturers, specialty distributors, office furniture dealers, hardware chains and major home centers. Experts in the application, design, and supply of precision slides for fine furniture and appliances, enclosures, tool chests, and industrial equipment. 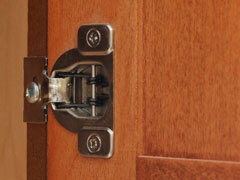 Offers a comprehensive line of decorative hardware for cabinets and furniture. Michigan-based manufacturers of unique, theme-based cabinet hardware. Manufactures self-adhesive polyurethane bumpers often used on kitchen and bathroom cabinet doors and sliding drawers. Furniture slides for cabinet drawers and shelves, tables, hanging files, and sliding doors. This Austrian company features Euro style fittings systems for quality furniture. 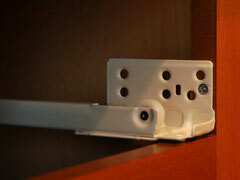 This Austrian firm offers drawer slides, hinges, brackets, and accessories. This Italian firm features European style furniture hinges, connection fittings and opening systems. "Today's Fashion in Handles and Knobs." Siro's products are sold to kitchen cabinet makers and furniture manufacturers as well as to distributors and home centers around the world. Siro Designs is based in Austria. German manufacturer of hinges, drawer slides, and door hardware for the furniture trades and crafts as well as the do-it-yourself market.